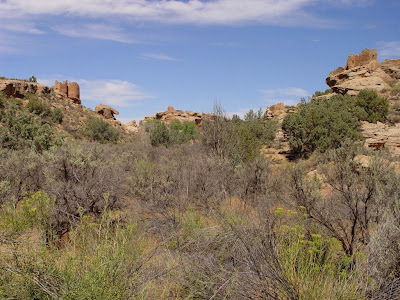 For today's post on the Abandoned Lands I am jumping into my personal "Wayback Machine" to revisit a hike I did in 2003 on Cedar Mesa, the western edge of the Ancestral Puebloan "fertile crescent". The crescent was (and still is) a highly productive agricultural area, and supported a large population between about 600 - 1,300 AD. We didn't do this hike on our more recent trip, but I thought it fit nicely with my theme of the fusion of rock and architecture. It remains one of the most memorable hikes of my life. 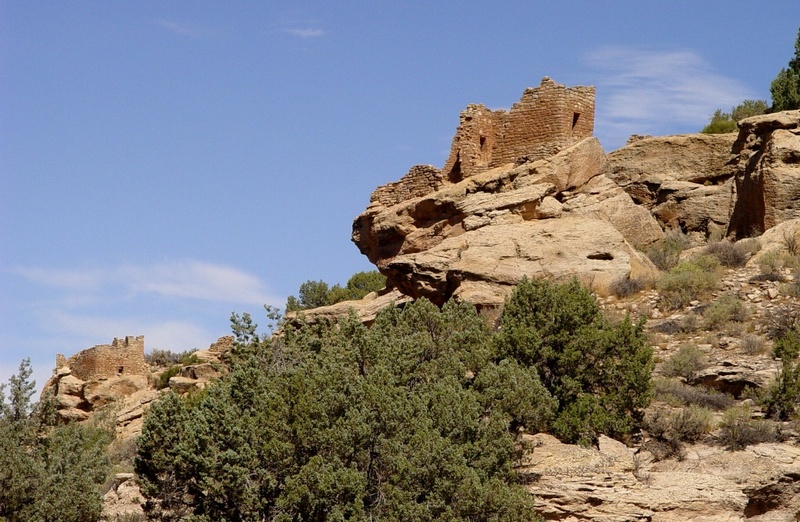 Access is the death-knell to Ancestral Puebloan ruins. The closer they are to roads, the more likely they are to be destroyed by pothunters and vandals (both of whom are the lowest of human beings). To see these wonderful ruins, we had to walk a total of eight miles, and that doesn't count the required climbing to approach the ruins themselves. There was only a trail of use to follow. 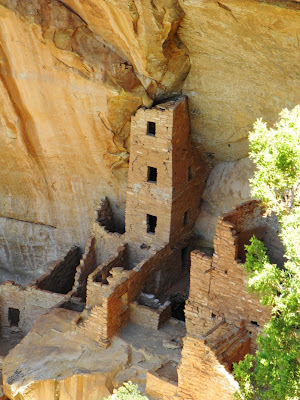 The ruins in the canyon (there are eight or so of them spread over three miles) are in surprisingly nice condition, with intact walls, doorways and ceilings. The dwelling in the pictures above and below even has an intact stairwell. This particular ruin is relatively inaccessible; people can get to it, but it requires a somewhat vertiginous crawl up some precariously perched logs on an 8 or 10 foot overhang. I haven't managed it yet in two tries (because I knew I had to get back down, and wasn't sure of myself). Some of the alcoves don't have dwellings (anymore) but they do have pictographs, including the hand prints below. These messages communicate to me the humanity of a single individual who lived in this place 700+ years ago. 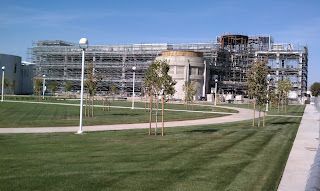 I talked in previous posts of the frustration of having ruins that have been stabilized and "cleaned up". One starts to lose that sense of personal discovery (my so-called Indiana Jones effect; it's addictive and not really good archaeology). 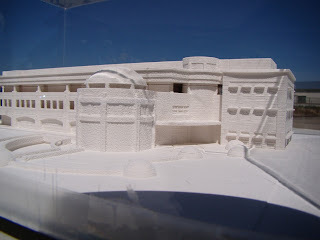 Of course it makes sense that a park with high visitation would never leave artifacts out in plain sight. They would disappear quickly. Here, miles from the end of the road, people have decently left things in place for others to see. The remnants of some kind of woven yucca fibers, a moccasin maybe? Corncobs, minus the corn (rodents are very active in these ruins). The Ancestral Puebloans subsisted on maize, beans and squash, with the occasional supplementary meat provided by rabbits, deer, and bighorn sheep. As we drew closer, more walls appeared, molded seamlessly into the vertical cliff. The walls hid a series of small alcoves into which rooms had been constructed. Instead of a single room perched on a block of rock, this was a small pueblo complex with at least seven or eight rooms. The upper log sticking out of the cliff was probably the brace for a ladder that accessed the rooms even higher up the cliff. We shimmied up the log to access the pueblo, and were surprised by how much space was present behind the outer wall. 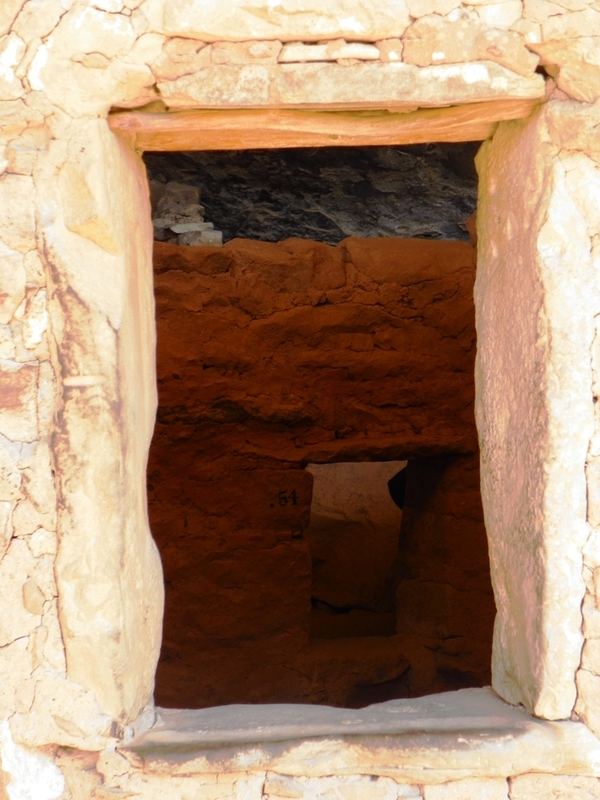 The walls and doorways were remarkably well preserved. The lintels over the doors were still encased in the adobe, and in many places, the fingerprints of the builders were preserved. The logs forming the ceilings were unchanged, except for generations of cooking fires. Roof intact, plaster coverings intact, wood unburnt...this was one of the best-preserved pueblos I've ever seen. 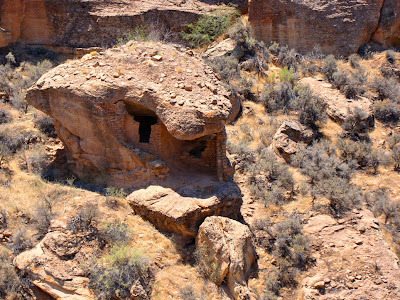 The dwelling is referred to as the Wall Ruin, and it is 3.7 miles up the canyon. You may notice I'm not making a big issue about where the dwellings are located, but there are enough clues here to figure it out on the internets with a bit of searching. I want this place to be here 700 years from now, and even though these sites are legally protected, any idiot can destroy centuries of culture in a matter of minutes. I've even heard of morons who used wood beams from 700 years ago...as firewood. I like to think that spirits of the ancestors still inhabit these places, and I like to think that they will make life miserable for those who abuse and vandalize their realm. 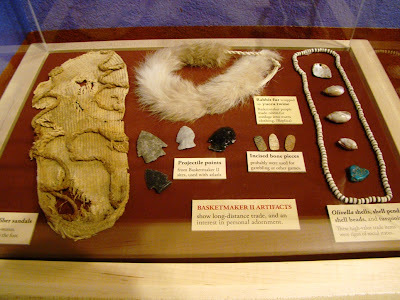 The next portion of our journey would take us into a different landscape, one that was largely ignored by the Ancestral Pueblo people, a place where it was too dry to grow crops and subsist off the land. We were headed into the Canyonlands. 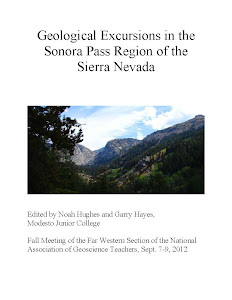 Meanwhile, in the present day, I will be on the road for a few days, taking our students on a field studies excursion into the eastern Sierra Nevada and Owens Valley. See ya'll in a few days! 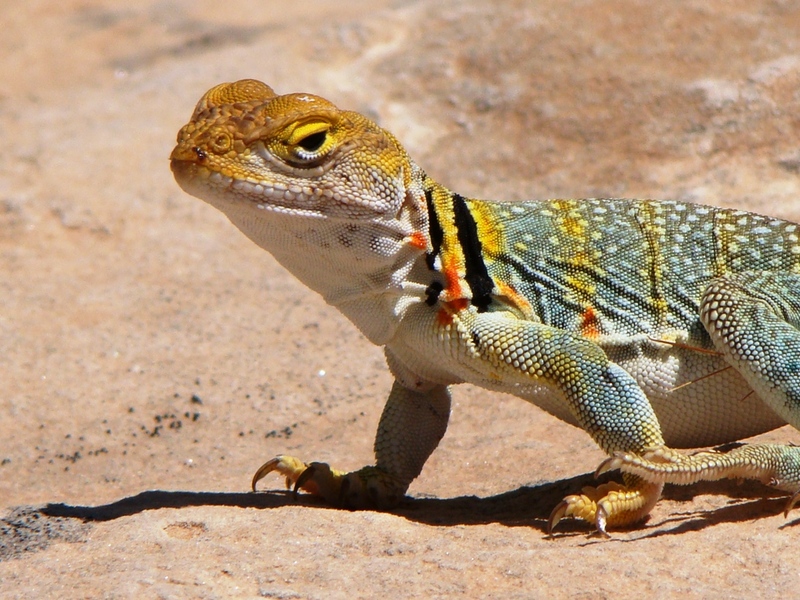 The Abandoned Lands...A Journey Through the Colorado Plateau: The fusion of geology and architecture, part 1 (and a gratuitous lizard photo). 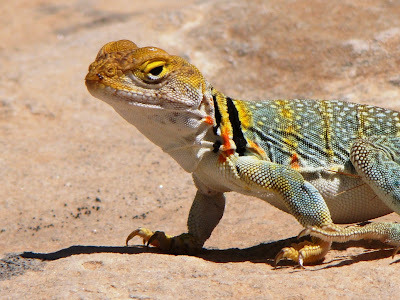 OK, the lizard was an attention getting device...what I really want to talk about is the stunning beauty that resulted when the Ancestral Pueblo people built their homes in total harmony with the landscape they inhabited. Two places really stand out in my experiences, Hovenweep National Monument on the Utah-Colorado border, and a canyon on Cedar Mesa a bit further west in Utah. In so many places where humans live, their houses and other buildings are imposed on the landscape regardless of appearance or topography. 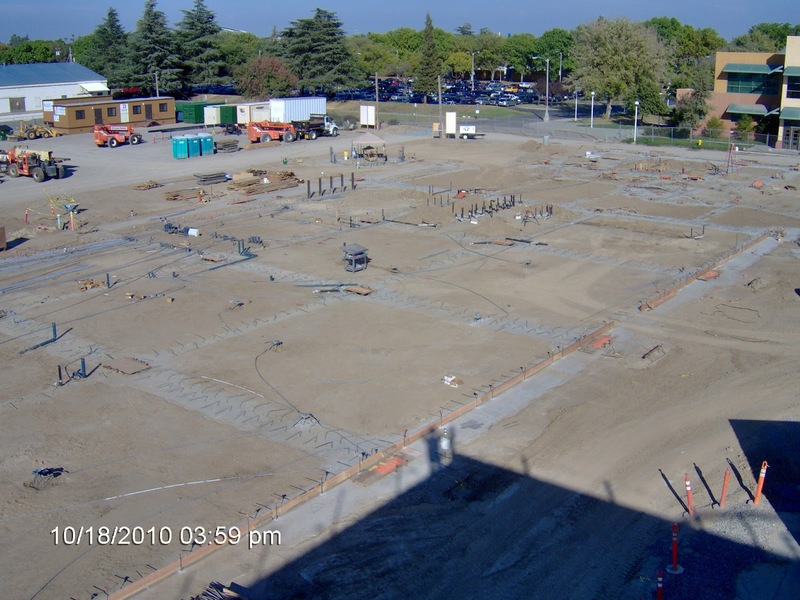 If the land doesn't conform to the builder's desire, the land gets changed, bulldozed, straightened and groomed. 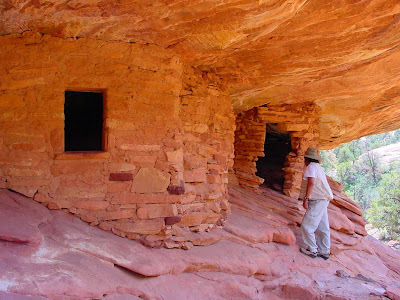 When I first arrived at Hovenweep National Monument and gazed at the structures of the Ancestral Puebloan people, I was struck by how the buildings conformed to the rock. 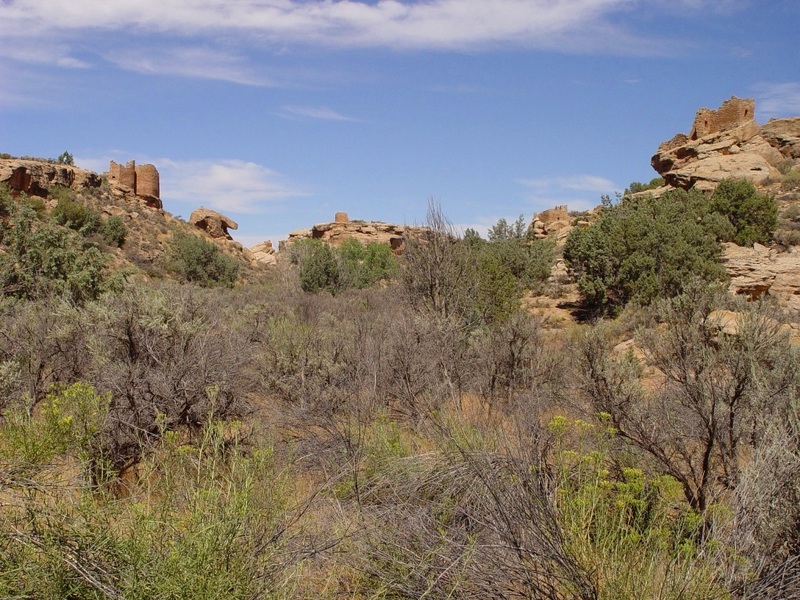 There is little to be seen of the full extent of the habitations that must have existed here, as many of them remain unexcavated and hidden by sagebrush and debris. Built the most unique structures line the rim of the canyon below the visitor center. It feels like the dwellings and towers grew out of the rock itself. Many of the structures were constructed on top of huge fallen boulders and the buildings follow the contours of the rock. 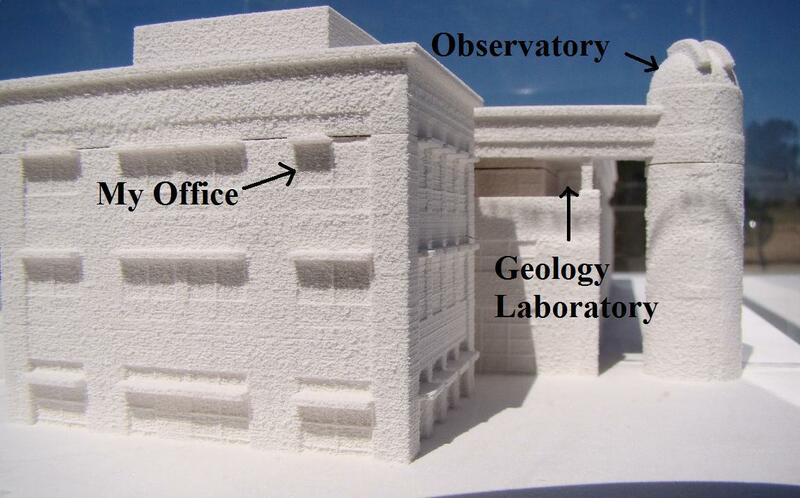 It is sometimes hard to discern the function of some of the buildings, with the strange placement of doorways and windows. Towers would seem to be used for observation posts, but some of the towers were constructed in the canyon where nothing in particular could be viewed. Looking across the canyon the twin tower command one's attention, but upon closer inspection, one realizes there is another dwelling inside the big boulder on the right. There are several rooms in the boulder, and the debris on the top of the boulder suggests there was once a structure on top. I don't really want to be flippant, but I look at these dwellings and I almost imagine Dr. Suess characters living here. 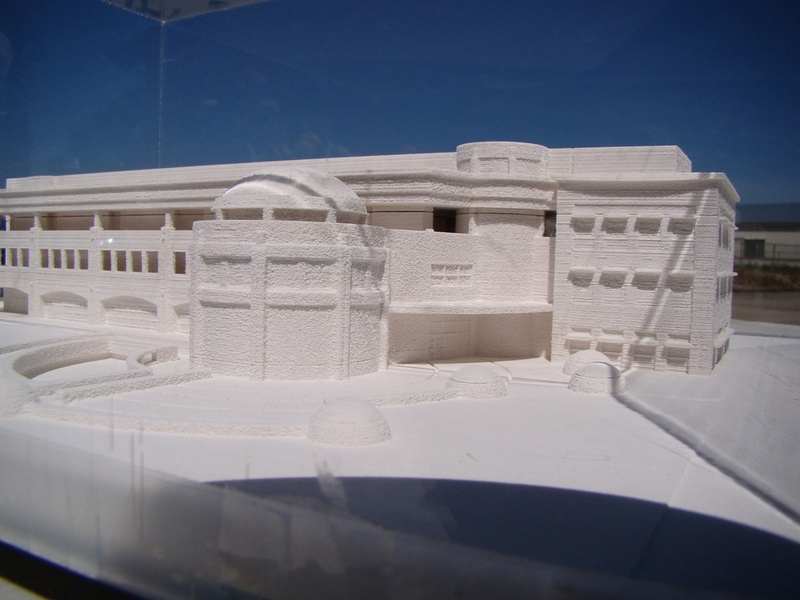 Whatever the reasons were for the construction of these wonderful buildings, I have to appreciate the creativity that they represent. 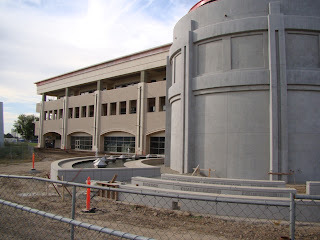 In the next post, I will be getting into the Wayback Machine (does anyone recall that allusion?). 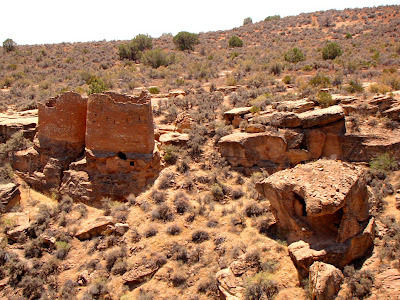 It's been a decade or so since I took a walk through a magical canyon on the western edge of the "fertile crescent" of the Ancestral Pueblo people on Cedar Mesa, and discovered a near total fusion of human habitation and rock. It wasn't part of our trip last summer, but it seems to fit the theme of the moment. The Abandoned Lands...A Journey Through the Colorado Plateau: What will the evidence be of your passage? Our journey throught the Abandoned Lands continued. We were on a combined geology/archaeology field studies trip last June, and for much of middle part of the trip we were following in reverse the journey of the Pueblo People to their present-day homes along the Rio Grande River. We explored Bandelier, Chaco Canyon and Mesa Verde, and were now making our way through the "fertile crescent" of the Ancestral Puebloans that extended from Mesa Verde to Cedar Mesa in Utah. As a rank amateur in archaeology, I had always somehow assumed that the cliff dwellings in places like Mesa Verde had always been the home of the Ancestral Puebloans for hundreds of years. As we have seen in the last few posts of this series, the famous cliff dwellings were home to the people for only a few generations before they abandoned the region for the Hopi mesas or the Rio Grande. 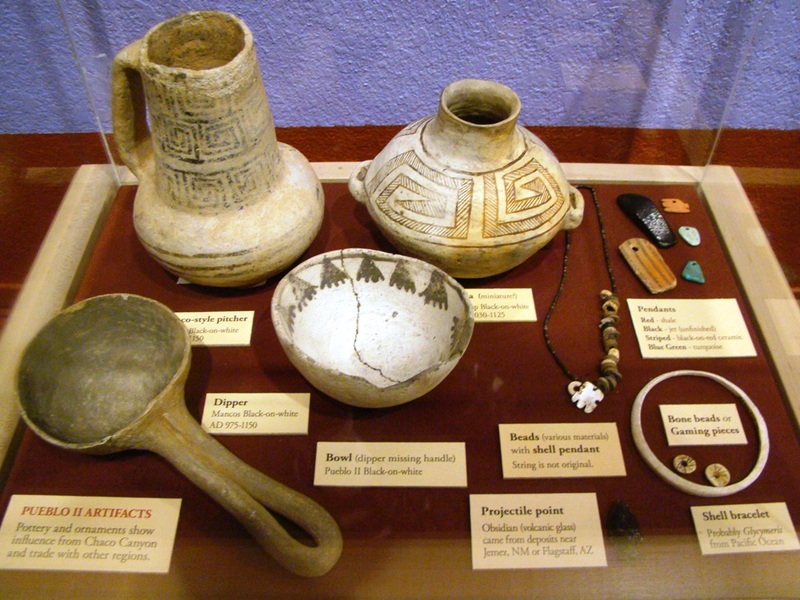 For more than a thousand years, the people lived in pithouses and small pueblos spread widely across the Colorado Plateau. From what we can tell today, fear of invasion or warfare was not part of their story until the very end, the last few generations. I always had a tendency to think of the lives of the Ancestral Pueblo people in terms of their buildings, their pottery and their arrowheads. In my own journeys that was nearly all I ever saw of their lives, aside from the petroglyphs and pictographs I've discovered here and there. 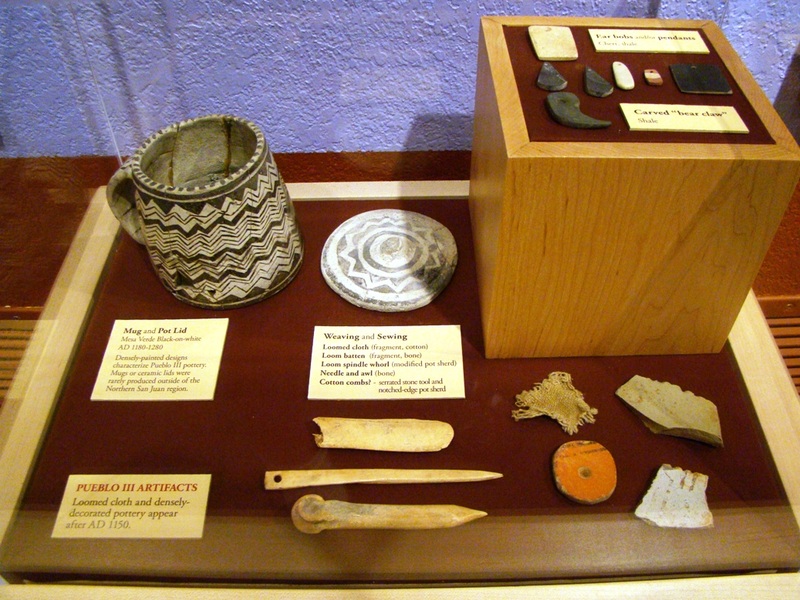 The meticulous work of the archaeologists goes a long way towards filling out the daily lives of the people who lived on this land for so very long. The Dolores Rivers carves a deep canyon just north of Cortez, Colorado, and was an ideal site for a reservoir to be built in this arid landscape. 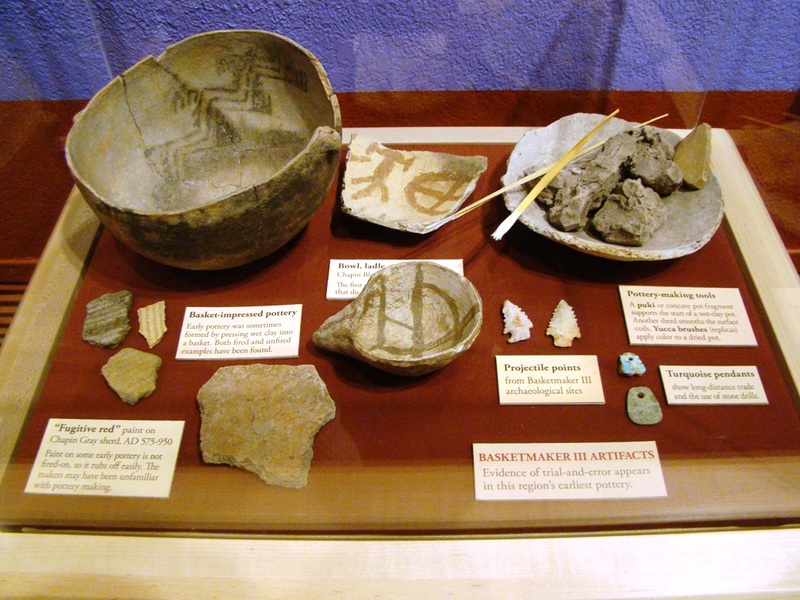 The resulting lake would have covered and destroyed hundreds of sites, so a rapid excavation of as many sites as possible was undertaken, and the three million artifacts formed the basis for the collection at the Anasazi Heritage Center in Dolores, Colorado, an excellent museum and research center run by the Bureau of Land Management. 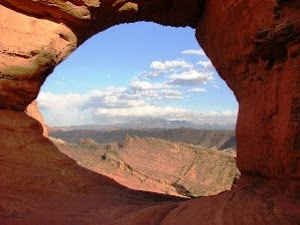 The Center also serves as the headquarters for the Canyons of the Ancients National Monument. 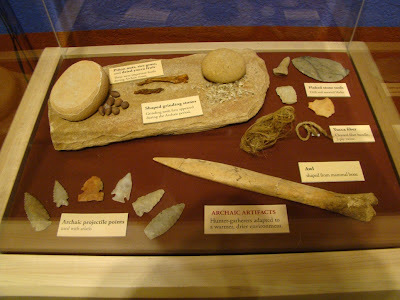 We were on a field trip, but artifacts like these are rarely seen in the field. This was as close as we could get to "feeling" the lives of these people, of getting close to what daily existence was like. So today is a series of pictures that are snapshots of a particular period in the lives of the Ancestral Pueblo people. It is amazing to me how well some of these artifacts survived (especially considering the trepidations of pothunters and other vandals). I always dream of finding things like this while on an expedition in the wilds of the Plateau country. Who doesn't want to be the next Indiana Jones? But as the years have passed, I have come to realize the value of allowing excavations to be done by those who have the training to interpret what they are seeing, and the value of seeing the objects in context. The issues are the same as those involved with paleontology and the loss of information when vandals dig up dinosaur bones or precious fossils like those of the Burgess Shale in British Columbia. 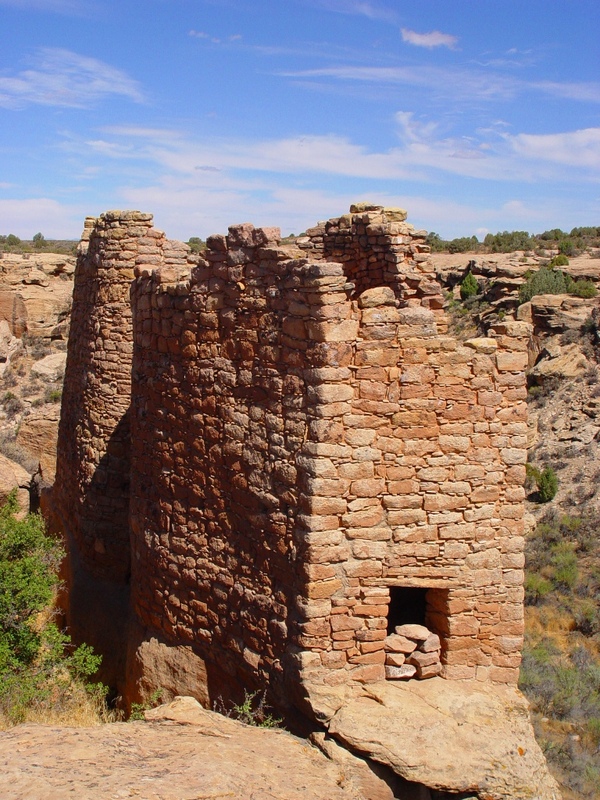 In our next post we explore the heart of the "fertile crescent" of the Ancestral Pueblo people at Canyon of the Ancients and Hovenweep National Monuments. 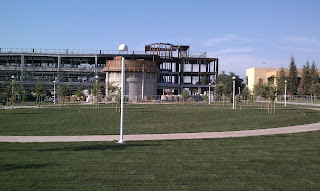 Six Weeks to go...I think this Science Community Center just might happen! 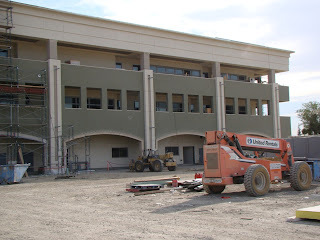 If you've been following Geotripper for awhile, you may realize that we have been watching the construction of our Science Community Center on the campus of Modesto Junior College. 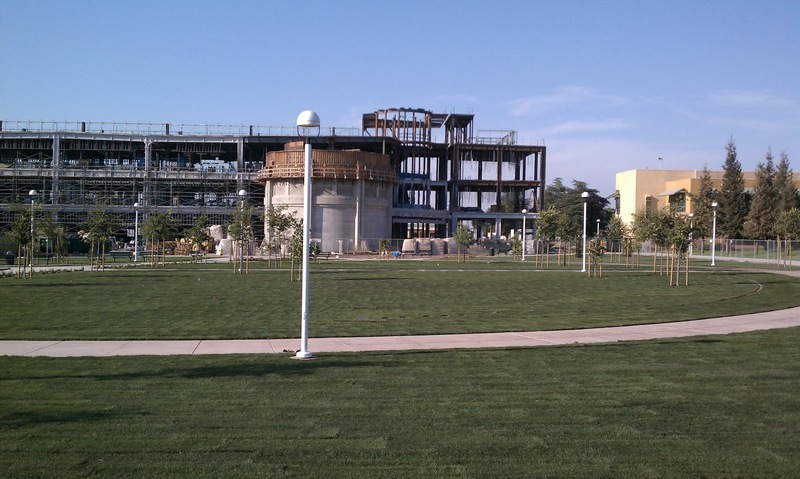 It is a complex that will include the instructional areas for Chemistry, Biology, Physics, Earth Science, Geology and Astronomy, as well as housing the Great Valley Museum, an observatory, and a planetarium. 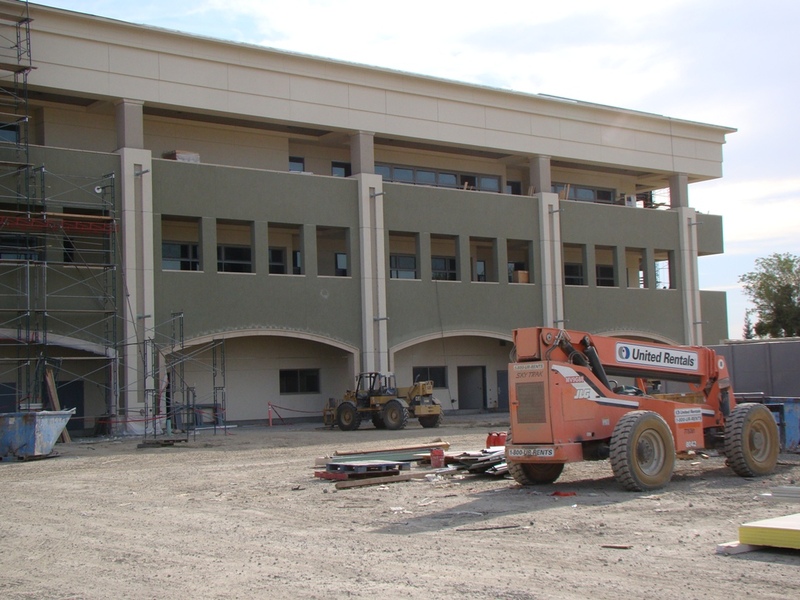 The building represents the commitment of the people of Modesto and the surrounding communities to the advancement of science in our region, a region that experienced the worst of the recent depression and then some. 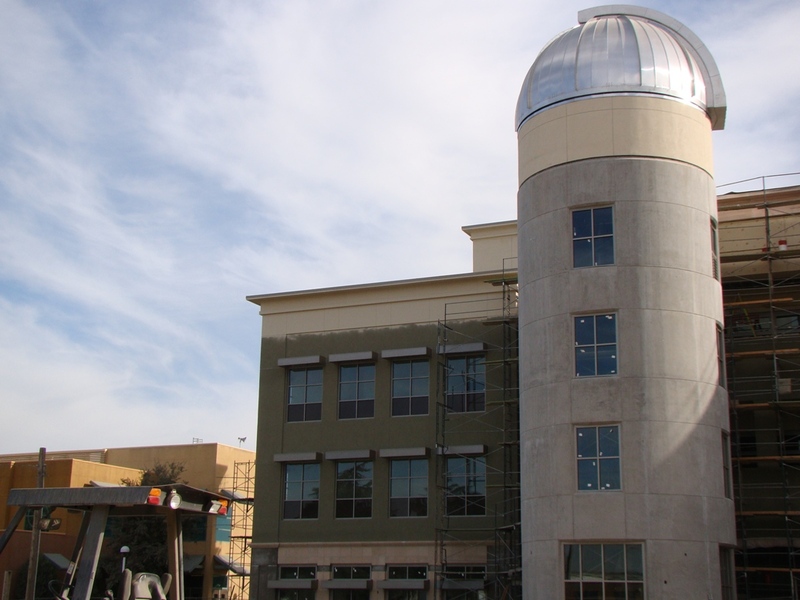 We have the highest unemployment and the highest foreclosure rate in the country, but we came together to create what will be one of the finest centers for science education in Central California. 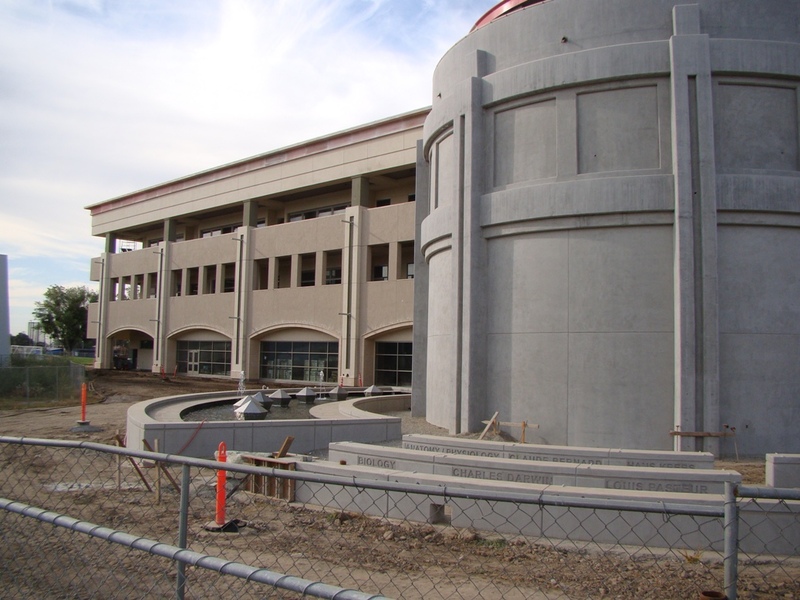 It felt for a long time like it wouldn't happen, and when construction started, it looked like it would be cut back and huge compromises made. 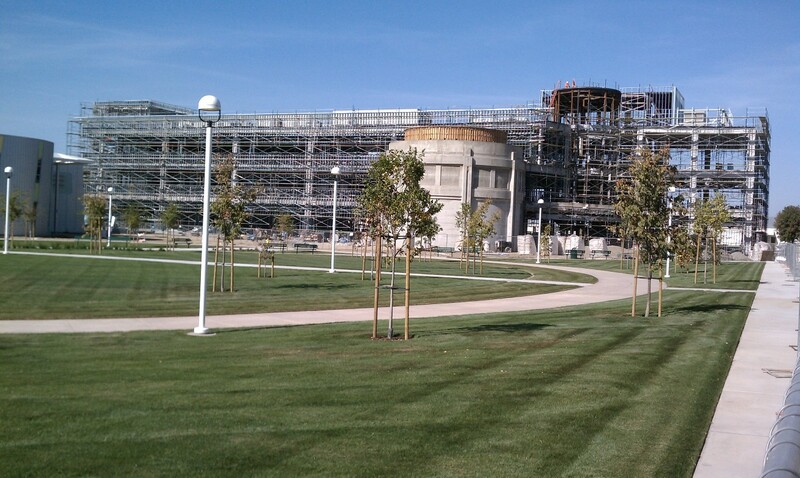 But events conspired to allow an even better facility than originally planned (in short, the recession cut down on construction costs). And now we come to this afternoon. 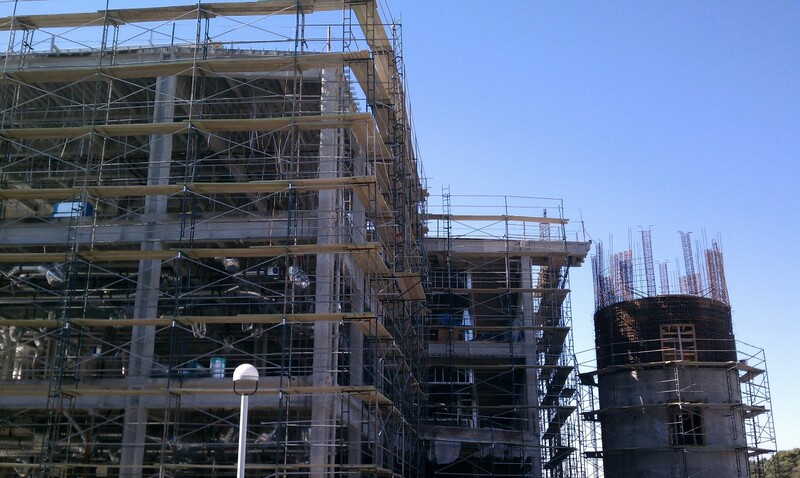 We toured the building, coming to the realization that it will be completed in less than two months! 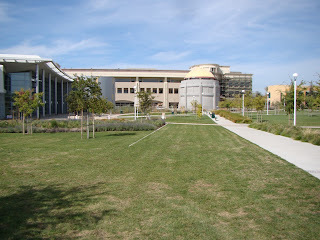 We will be moving in for the spring semester (barring all the myriad things that could go wrong). But it is getting close. 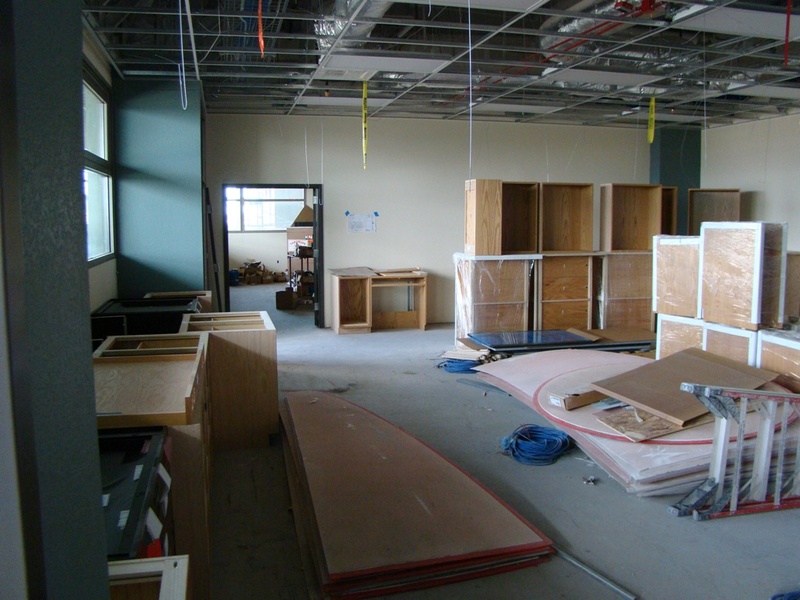 There is carpeting and cabinetry in many of the offices and labs. There's no telescope in the observatory, nor a projector in the planetarium, but there are foundations ready for them. I expect the next report on the Science Community Center will be the building dedication! The Abandoned Lands...A Journey Through the Colorado Plateau: In death and the end of all things, there is beauty? One sometimes hears such statements about some pastoral time when humans lived off the land, living in peace with their neighbors, and as such there was this Eden-like quality to existence. A moment's thought will probably lead one to realize that such situations in the human sojourn on this planet have been exceedingly rare. 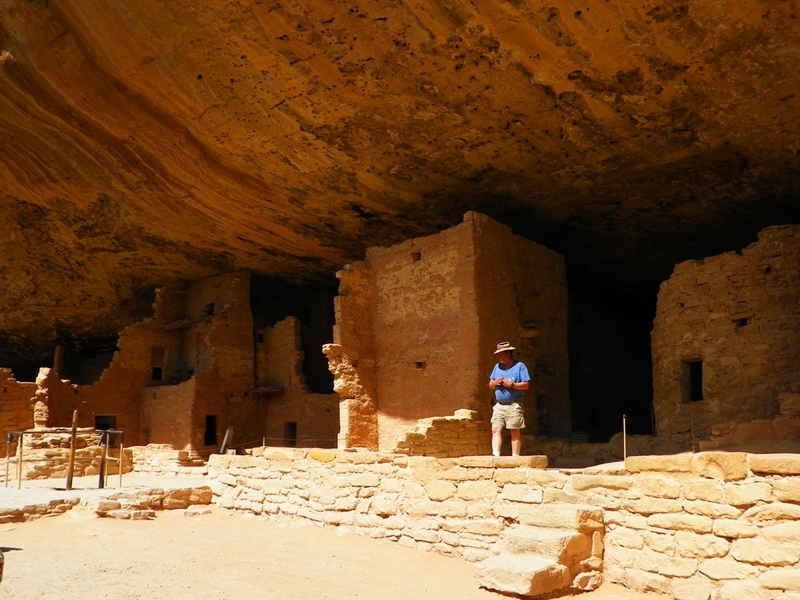 We were continuing with our journey through the Abandoned Lands, the world of the Colorado Plateau. 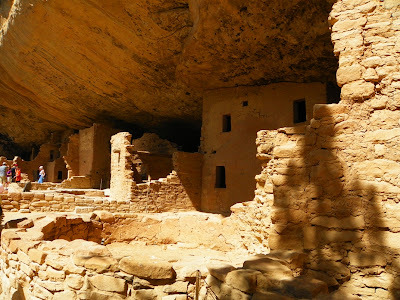 In the last post, we were taking stock of the landscape that surrounds the famous cliff dwellings of Mesa Verde National Park. In a sense, the Ancestral Pueblo people did live a rather harmonious existence at Mesa Verde. 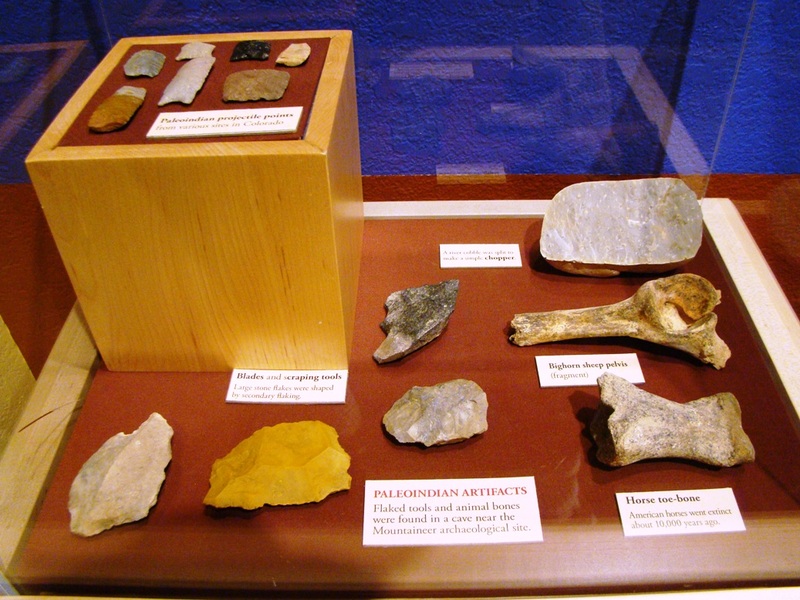 The available evidence suggests that people lived on the flat divides of the mesa for more than 600 years with little violence or warfare. How many parts of the world can claim such a record? That isn't to say that life was in any way easy. In some ways life was brutal and short; the average lifespan was less than thirty years, and elders who reached their fifties were rare. Many burials show evidence of disease, and the gritty corn meal wore teeth away at a horrific rate. Women often died in childbirth. 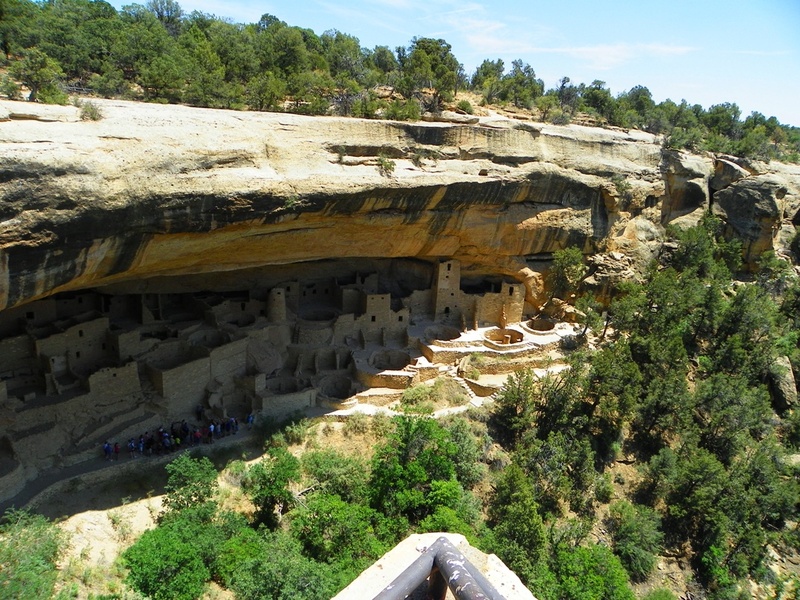 And then there are the incredible stone cities that lie in the alcoves of Cliff House Sandstone that made Mesa Verde so famous. 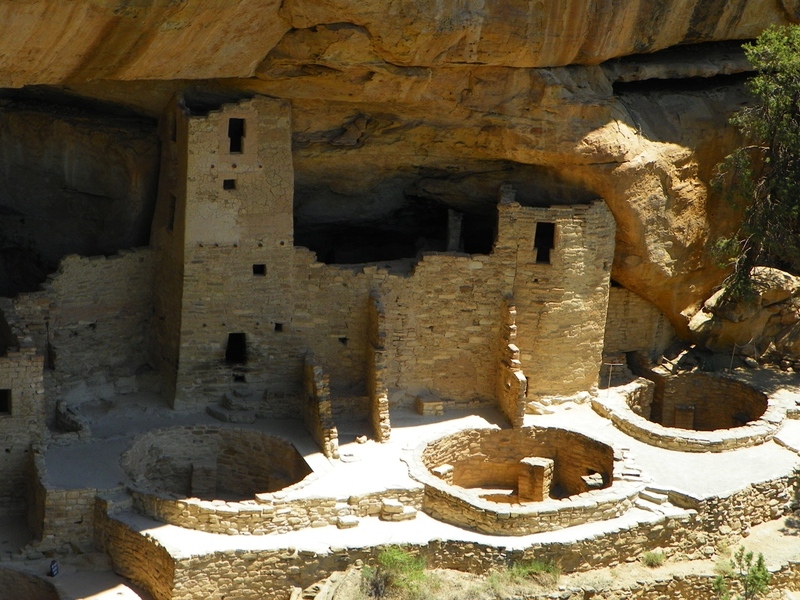 They are so striking in their architectural grace that one can look at them and sense that the Ancestral Puebloans had reached the pinnacle of their technological development when they built these dwellings. The truth is, as always, complicated. Most of them were constructed at the beginning of the 1200s and they were mostly abandoned before 1300. For more than 600 years, the Ancestral Puebloans were content to live in small villages and family pithouses on the mesa tops. The alcoves containing the stone cities were cold and drafty in winter, they were practically inaccessible, and often far from water sources (a few alcoves had springs that emerged in the rear). For all their architectural grandeur, they were not comfortable places to live. One could just as easily ask why Europeans built unassailable castles. They didn't want to be assailed. 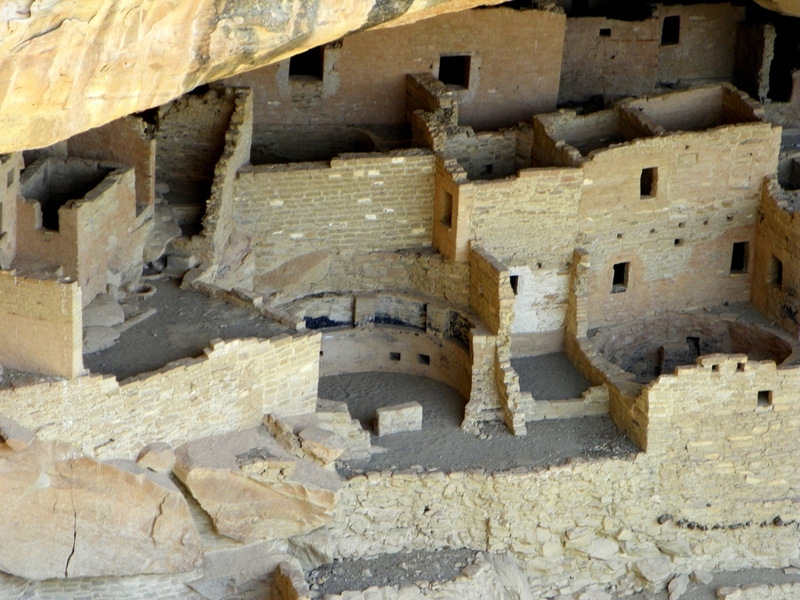 The stone cities of Mesa Verde, plain and simple, were fortresses. 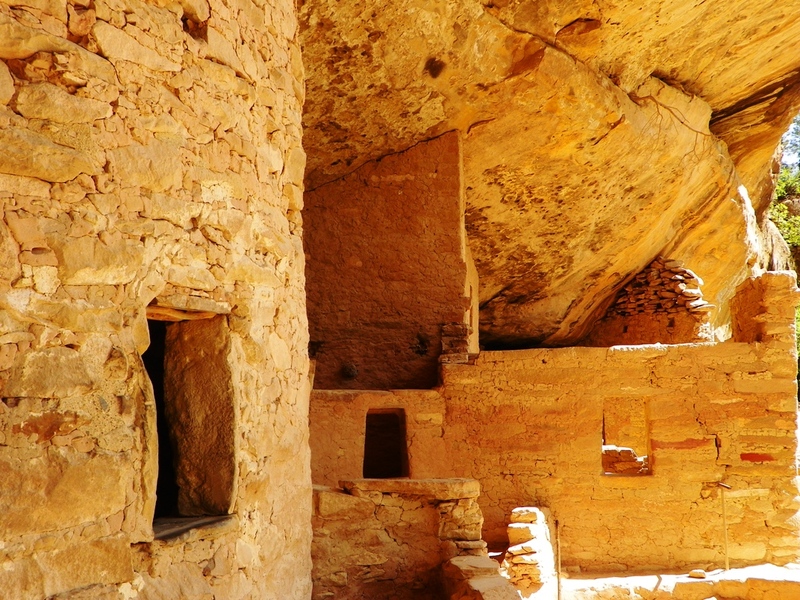 Despite their beauty, the cliff dwellings were the harbingers of the end of human occupation of Mesa Verde, an omen that foretold the abandonment of a place that a people called home for 600 mostly peaceful years. What went wrong? Anthropologists are not in complete agreement. But something they do agree on is that the archaeological record shows more evidence of violence and warfare at this time than in any comparable period in Ancestral Puebloan history. Some of the dwellings contained butchered bodies that were never given burials. The pathology was obvious: their skulls were bashed in and the structures purposely burned. I wrote of the tragedy of one of these villages, Castle Rock Pueblo, which can be found west of Mesa Verde. The villagers came to a sudden violent end about 1280, and the pueblo was never again occupied. What events transpired that led a culture to live in fear for upwards of a century? What precipitated their final abandonment of the entire region? There have been stories of invaders from the north, but archaeological evidence for outside intervention is sparse at best. Was the violence fratricidal? 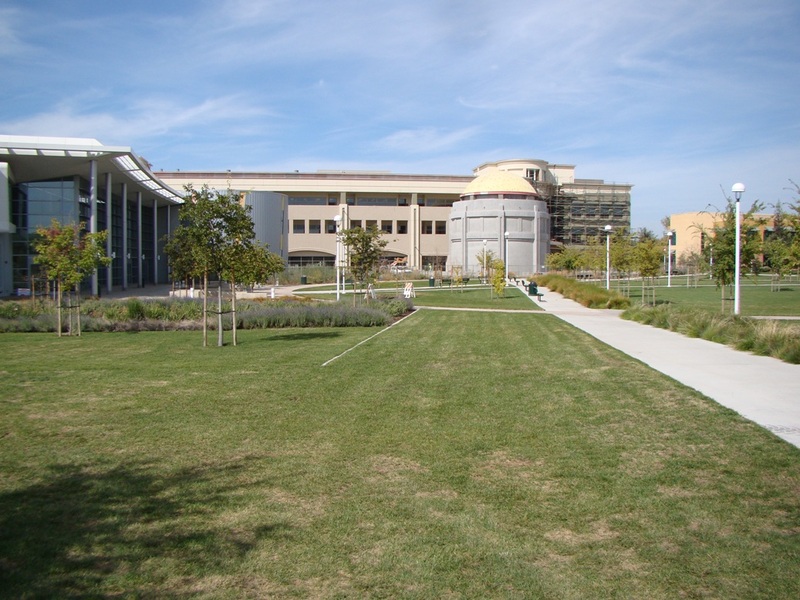 There were intense multi-decade droughts that could have brought about crop failures and soil loss from erosion. Food stores may have run short. Faced with starvation, what would you do? 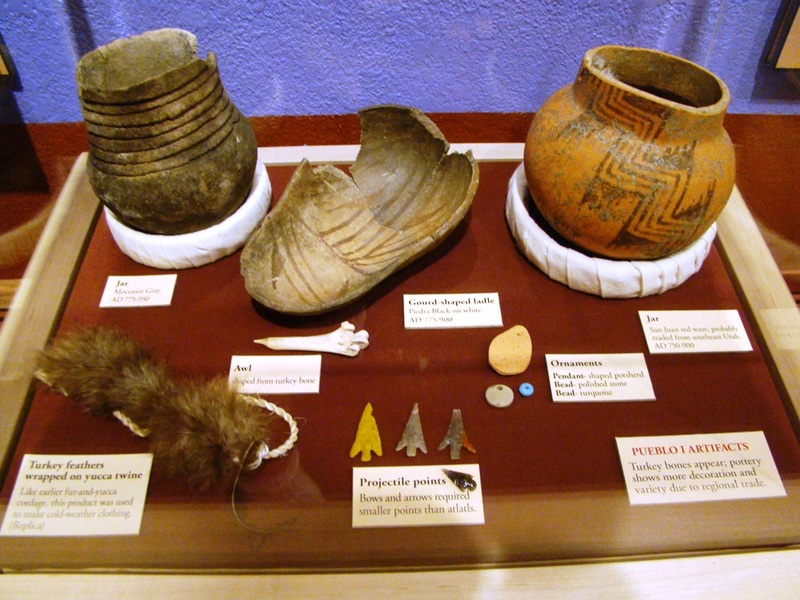 There is mystery about the reasons for the disappearance of the Ancestral Pueblo people, but there is no mystery about where they ended up. 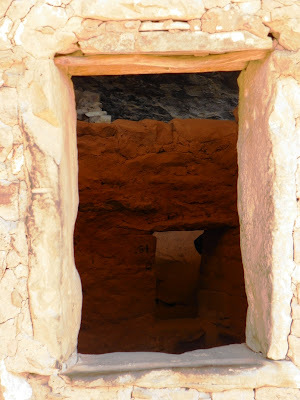 We have been exploring the lands of their descendants on this blog journey, at the pueblos along the Rio Grande River, and at the Hopi mesas. They have weathered many turbulent events and upheavals, but have persisted in this hard landscape when many others gave up. As I pointed out in the previous post, this was a most extraordinary day: I left my camera in camp. All of these wonderful photographs are courtesy of my own Mrs. Geotripper.